Control a range of insect pests including whitefly, thrips, leaf miners and greenfly in the greenhouse or conservatory. Double sided sticky traps 24 x 10 cm (Approx. 9.5 x 4in) Small flying insect pests are attracted by the unique yellow colour and stick to the non-drying glue coating the trap Many insect pests, are difficult to control with insecticides. By catching the winged adults with Yellow Sticky Traps before they reach the plants, the build up of pests will be delayed. Existing insect populations may also be reduced. If the problem is severe biological controls may be used. 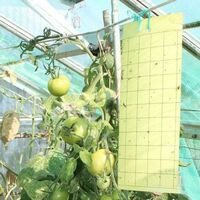 Posted on March 25, 2019 by Shaun OConnor in Gardening Naturally and tagged Gardening Naturally, Greenhouse Care & Sowing > Greenhouse Pest Control, Yellow Sticky Insect Traps For Whitefly Control. 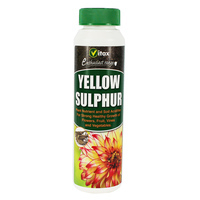 Yellow Sulphur Powder is used for the control of powdery mildew on many fruits, flowers and vegetables including gooseberry, chrysanthemum, cineraria, cucumber, delphiniums, ornamental hops, hyacinth, marrow, peas, rose and strawberries. Can also be used to control storage rots of bulbs, corms and tubers, including Penicillium rot of Gladioli and Sclerotinia rot of Dahlia, when applied before storing away. This is a plant nutrient and soil acidifier. Sulphur is an important secondary nutrient for most plants and plays an important role in the vital components of amino acids, and is therefore essential for efficient protein production. Posted on March 25, 2019 by Shaun OConnor in Gardening Naturally and tagged Gardening Naturally, Plant and Garden Care > Plant Care and Disease Control, Vitax, Yellow Sulphur Powder for Powdery Mildew. These stylish planters are great for herbs or blooming plants. The jute handles also make them great for collecting clippings or even as a table decoration or drinks bucket. Use individually or as a group to decorate your patio or outdoor space. Set of 4. 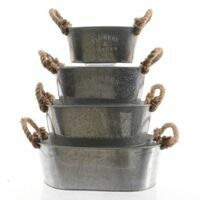 Posted on March 25, 2019 by Shaun OConnor in Gardening Naturally and tagged Gardening Naturally, KAEMINGK, Outdoor Living > Pots & Planters > Outdoor, Zinc Planters with Jute Handles - Set of 4. 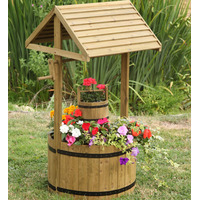 These wonderful, woodland wishing well planters have a wooden bucket for planting as well as the well base. Makes a charming addition to the garden or patio. Easy to assemble with full instructions provided. Made from robust pine in a natural finish. Plastic liner included. Posted on March 25, 2019 by Shaun OConnor in Gardening Naturally and tagged Gardening Naturally, Outdoor Living > Pots & Planters > Outdoor, Smart Garden, Wishing Well Flower Planter. 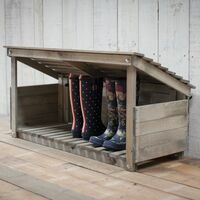 Posted on March 25, 2019 by Shaun OConnor in Gardening Naturally and tagged Gardening Naturally, GARDENTR, Tools & Garden Maintenance > Harvesting & Storage, Wooden Welly Store.